KIEV, Ukraine -- Ukraine will take the first steps this week towards forming a new government, President Petro Poroshenko said on Monday, seeking to assuage concern among his Western allies that the delay is holding up reform and imperiling Western assistance. 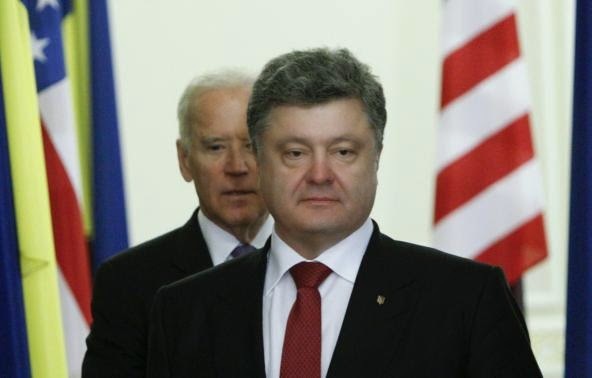 Ukraine's President Petro Poroshenko (R) and U.S. Vice President Joe Biden walk into a hall before a news conference in Kiev, November 21, 2014. The U.S. and other Western governments are criticizing Kiev's tardiness in putting together a government following October elections - with suspicions that the delay is due to rivalry between Poroshenko and Prime Minister Arseny Yatseniuk over control of key portfolios. "We hope that the process (of forming a government) will begin this week," Poroshenko said at a news conference with visiting Lithuanian President Dalia Grybauskaite, apparently referring to the first session of the new parliament on Thursday. Separately, Poroshenko also announced that Lithuania would provide Ukraine with some military aid to help Kiev in its fight against pro-Russian separatists in the east of the country. "We have agreed on supplies of concrete elements of concrete armaments for the Ukrainian armed forces. This is real help," Poroshenko said standing alongside Grybauskaite. It was not clear, however, if Lithuania was following fellow NATO member the United States in providing non-lethal military equipment or whether it was supplying weaponry - something NATO countries have so far been reluctant to do in case arming a non-member prompts a conflict with Russia. Ukraine has pressed NATO countries to provide weapons to help it defend itself against attacks by well armed Russian-backed separatists who, before a ceasefire came into effect, inflicted heavy losses on government forces in their fight to hive off parts of Ukraine's east. Despite the ceasefire, three more Ukrainian soldiers were killed overnight into Monday, the Kiev military said. Kiev says more than 150 government troops have died since the truce came into force on Sept 5. The United Nations says more than 4,300 people have been killed overall in the conflict. Asked whether Ukraine would seek to join NATO, Poroshenko held out the prospect of a referendum in several years' time, but said attempts to join now would cause "more harm than good". Before the confrontation with Russia, Ukrainians showed little interest in joining NATO, and the country's constitution specifies a "non-bloc", unaligned status. But since Russia's annexation of Crimea in March and Moscow's open backing for the pro-Russian rebellions, popular support for joining the Alliance has shot up. Last week, U.S. Vice-President Joe Biden became the latest Western politician to express concern at Kiev's slowness in forming a new government team, without which new International Monetary Fund credits and other Western assistance cannot be released. "Form a new government as quickly as possible. It should be done in days not weeks," Biden said in Kiev. He said a new government was vitally needed to form stronger democratic institutions, enhance integration with Europe and fight "the cancer of corruption". Poroshenko, elected in May after "Euromaidan" street protests overthrew Moscow-backed Viktor Yanukovich, did not volunteer any explanation for the delay in forming a government which may now emerge early next week. But commentators say Poroshenko wants his candidate in the sensitive post of interior minister - though filling this post falls within the prerogative of the Prime Minister rather than that of the President. With the country at war, this would give Poroshenko, rather than Yatseniuk, control over a post which directs the National Guard and volunteer battalions fighting alongside government forces against the separatists. Yatseniuk, however, is said to be insisting that he keep the right to appoint the post, and keep his man Arsen Avakov in situ. Yatseniuk has steadily taken on the role of a hawk in Poroshenko's administration with strongly-worded attacks on Russia and Russia's Vladimir Putin. This contrasts with the smoother, more pragmatic style of Poroshenko who is insisting that there can be no military solution to the conflict and stresses the validity of the Sept. 5 peace deal even though both sides accuse the other of violating it. Poroshenko, a confectionery tycoon who was elected by a landslide last May, was on the receiving end of public anger for the first time last Friday when he was heckled by a crowd of aggrieved relatives as he paid his respects to the 100 or so people killed in the "Euromaidan" upheaval. They complained he had not fulfilled a pledge to make their dead kinsmen national heroes - something which brings financial benefits to the families. Poroshenko stepped away and later returned to announce that he would fulfill his promise after all.